Battlefield 1 players who didn’t purchase the first expansion for the game will doubtless be pleased to learn that it has been made a freebie for the PC (as well as Xbox One and PS4 consoles). PC gamers can grab the ‘They Shall Not Pass’ expansion from the Origin Store for nothing, whereas it normally retails for £11.99 or $14.99. The offer is only available for a limited time, until May 15 to be precise, so you’ve got just under a fortnight to make your move. 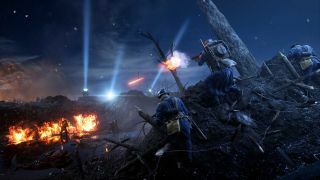 They Shall Not Pass sees the arrival of the French army, and the expansion boasts four new maps, plus a new game mode: Frontlines (which is a mixture of Conquest and Rush). There’s also a new class, the Trench Raider Elite, which specializes in close quarter action and melee with a rather nasty-looking spiked club. You also get two new operations – The Devil’s Anvil and Beyond the Marne – not to mention a whole host of other additions in the form of new tanks, a Siege Howitzer and more. EA is still actively developing Battlefield 1, with a new mode called Shock Operations expected to arrive next month. However, after June, things will be winding down on the game, with monthly updates coming to an end. Which is probably why this expansion has now gone free, as EA moves to focus on the next game in the series, which is rumored to be called Battlefield V (and is possibly going to be set in World War II). Still, there’s plenty of mileage in Battlefield 1 yet, particularly if you didn’t grab the first expansion, as a whole new world of stuff has just opened up for you. Incidentally, if you want to improve your game, check out our Battlefield 1 multiplayer tips and tricks.